There are a lot of reasons that our faces go red. It may be because we were embarrassed, or we have been engaging in a strenuous activity, or we have been crying. The reasons and the situations differ, but the result is the same: we are left with a tell-tale sign on our face. One look and our friends would ask: What happened? And, we’d be asking ourselves that same question. What happened to make our faces go red? Why does my face go red when I exercise? When we exercise, our faces and even parts of our chests turn pinkish or reddish because of the blood rushing to the surface. Our bodies produce heat when we exert too much, and to cool down, it increases blood circulation to the skin’s surface for the heat to radiate off. If you notice symptoms other than turning red, such as nausea, dizziness, and extreme fatigue, your body may be in danger of overheating. To prevent this from happening when you exercise, drink plenty of water and wear cool comfortable clothing. Why does my face go red when I feel embarrassed, angry or sad? Heightened emotions can make our faces turn red, especially when we have also been crying our hearts out. The exertion of crying and the body’s response to emotions can produce a “fight or flight” response that produces a rush of blood all over our body. The increase in blood flow also increases blood pressure, which makes our hearts go thump-thump-thump so fast. Why does my face go red when I drink alcohol? When we drink beer, wine or any other liquor, our bodies react to the alcohol content. Blood vessels, including capillaries, dilate and blood rushes through them fast when we take in alcohol into our systems. Increases in blood flow subsequently increases blood pressure, which also increases heart rate. Sometimes, though, there are people who are overly sensitive to alcohol. Even a little bit can make their faces go red. Doctors call this Alcohol Flush Reaction, or more commonly known as “Asian Flush,” a condition in which the body cannot break down ingested alcohol completely. There are many other circumstances that cause our faces to turn red. Some are situational, especially when we feel embarrassed, self-conscious, or highly emotional. Other circumstances are purely physical, especially allergic reactions and skin irritations. These physical conditions that make our faces go red include Rosacea, which is a chronic condition caused by constant dilation of capillaries, especially on one’s face. 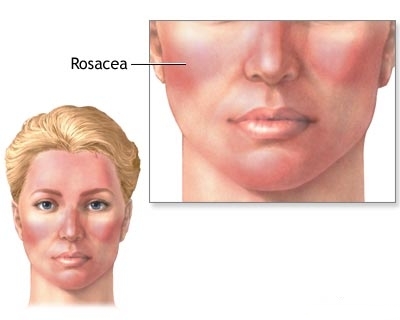 Rosacea is different from excessive blushing, which is often caused simply by being scared or self-conscious. Excessive blushing can be bothersome, especially when you need to interact with a lot of people in your job. Because of the negative implications blushing has – low self-confidence and incompetence – some people have turned to surgery to turn off the sympathetic nerve pathway that controls involuntary responses, including blushing. However, reddening up is not always harmless. It can also signal a more dangerous condition, such as high blood pressure or a heart attack. Why Does my Nose keep Bleeding?